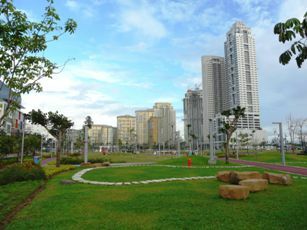 Bonifacio Global City (BGC) has a large advantage over other residential/business districts such as Makati and Ortigas: it was thoroughly planned from conception to current development.As part of this up-and-coming city’s development plan, open spaces take precedence over simply plopping down a high-rise office building on every block. Welcome to the home of souls passionate for personal health, fitness, and wellness! There are two main activity parks flanking BGC’s main artery, Bonifacio High Street. Great for family activities as much of the park is either soft grass of covered in rubberized tiles. Features traditional Filipino ‘street games’ such as the local version of hopscotch, and ‘tag’ (Patintero). Also features a jogging track. For the sporty and athletic types! Features a jogging track with differing elevations to challenge anyone from any level of fitness. Various strengthening and conditioning facilities are seamlessly integrated into the park. There are also two great activity centers for those who like outdoor sports more. The artificial-turf football field at Turf is home to both casual and professional football players from all around Manila. The Philippine national team, the Azkals, occasionally train here! A 40-foot bouldering wall which caters to climbers of all levels, from beginners to free-climbing professionals. Located inside one of the biggest recreational buildings at Bonifacio Global City, the Recreational Outdoor Exchange (ROX) building. On virtually every Sunday of the calendar year, Bonifacio Global City hosts at least one run, from short fun runs to long-distance road races. The running community of BGC is quite large, as the city is a very popular training venue for runners due to the clean air, wide roads, and organized traffic. To cater to this large running community, there are three main facilities at Bonifacio Global City. Features gait analysis technology and official distributor of specialty running shoes and apparel such as Newton and Brooks. The brainchild of celebrated Filipino running coach and celebrity athlete Rio dela Cruz and distributor of some of the best Nike, Asics, and Adidas running gear. True to its outdoor nature, it distributes plenty of trail and outdoor running gear and equipment, from The North Face to Columbia to Salomon, as well as triathlon gear. With so many opportunities to live a fit and active lifestyle, Bonifacio Global City is the perfect place to live, play, and raise a family. Never worry about missing a gym session (there are also fitness centers at BGC) as healthy living is available once you step outside your door! hi we are going to useyour Full up bar. morning til 3pm on this saturday 12 of september. 2015 do we need to get a permit ? Hi Edmon, we are a rental brokerage company focused in BGC. As far as we know there is no need to ask for a permit to use the park facilities. Happy workout! Hi… Any area in BGC for rollerblading? Thanks..
Hi! We’re looking to rent out Terra for a team building event with mini games and food carts around. Is it possible with Terra, Track green space or Turf? Thank you.